- Your own personal Astrology Gratitude Art Canvas. 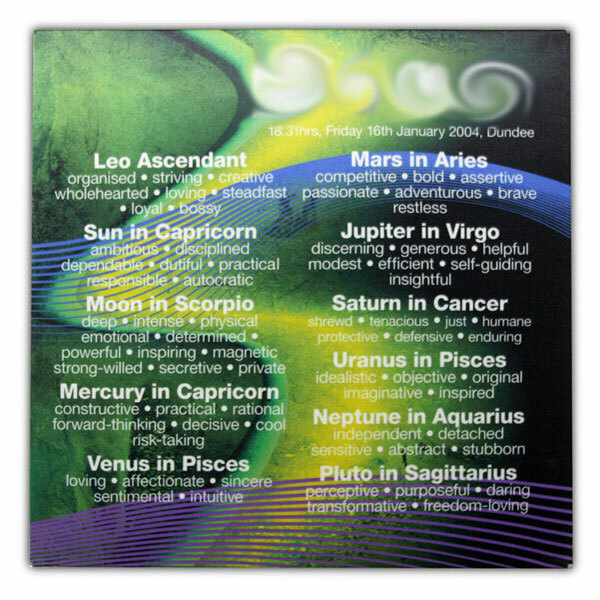 To order your personal Astrology Canvas - click on the product and send us your personal details so we can prepare it for you. Gratitude Art works with Astrologer Ann Savil in the production of these canvases. A perfect gift that will last a lifetime. ﻿﻿Each canvas is designed individually and the colours and elements of the design will depend on your Astrology reading. Here on this page you can see some examples. her Energy Healing sessions. Ann can be contacted through Gratitude Art.